The HMUA is committed to providing the community with safe, clean drinking water and quality wastewater management, while maintaining the highest standards of customer service. NOTICE is hereby given that pursuant to N.J.S.A. 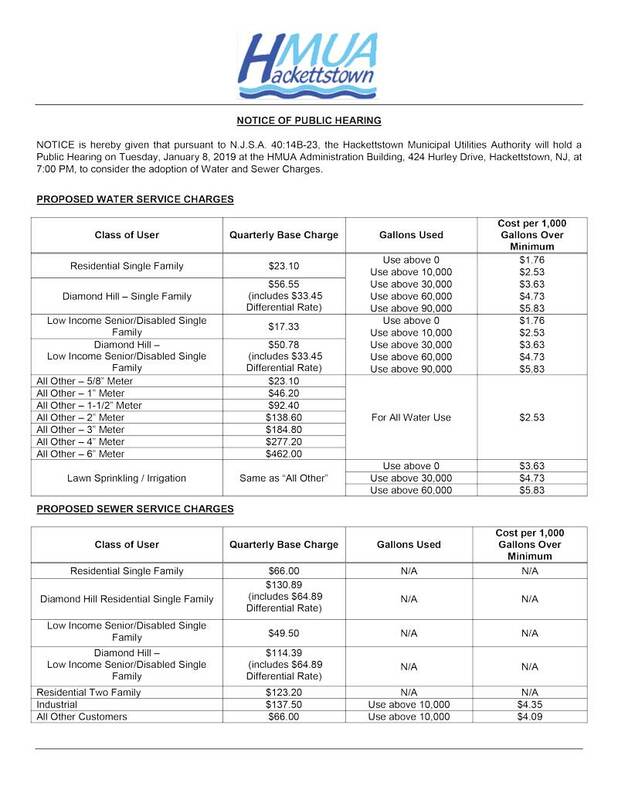 40:14B-23, the Hackettstown Municipal Utilities Authority will hold a Public Hearing on Tuesday, April 9, 2019 at the HMUA Administration Building, 424 Hurley Drive, Hackettstown, NJ, at 7:00 PM, to consider the adoption of changes to the water and sewer connection fees and other fees listed in the Rate Schedule in Section VII of its Rules and Regulations. Proposed changes are outlined below. o Water Filing Fee - $30.00 per EDU, but not more than $1,000.00 nor less than $200.00 for a project. In the case of one single-family dwelling, the fee shall be $40.00. o Sewer Filing Fee - $30.00 per EDU, but not more than $1,000.00 nor less than $200.00 for a project. In the case of one single-family dwelling, the minimum fee shall be $40.00. o Application Review Fee (Escrow) - $50.00 per EDU, minimum of $1,000.00 or as directed by the Authority. Meter Setting Charge: Cost of the Water Meter and Reading Device as purchased by the HMUA plus $30 for installation. *To shut off and discontinue service at the request of the customer, for a period of more than a week. No charge for routine shut off for less than 1 week. The proposed fee adjustments will be considered to become effective immediately upon approval of the HMUA Board following the public hearing. 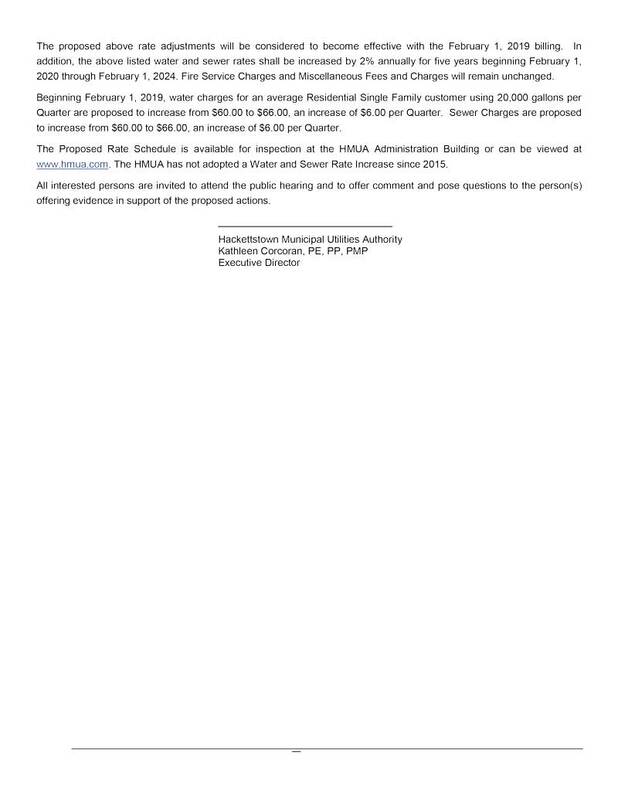 The Proposed Fee Changes are available for inspection at the HMUA Administration Building or can be viewed at www.hmua.com. All interested persons are invited to attend the public hearing and to offer comment and pose questions to the person(s) offering evidence in support of the proposed actions. The Hackettstown Municipal Utilities Authority (HMUA) has an immediate opening for a full time Deputy Executive Director. HMUA owns and operates public water supply and distribution facilities and sanitary sewer collection and treatment facilities serving five municipalities in Warren and Morris Counties. HMUA Customers are billed directly for water and sewer utility services. Water and sewer facilities include six water supply wells, two water booster stations, four water storage tanks, 100 miles of water distribution main, a 3.3 MGD wastewater treatment facility, four sewage lift stations and 80 miles of sanitary sewer collection system. SCADA and GIS are used extensively. Position includes close coordination with Executive Director, management staff and professional consultants. Responsibilities will involve working with engineering design drawings; maintenance of GIS information; SCADA systems; monitoring and tracking of operations performance objectives; oversight of construction and operations for quality assurance; tracking of system performance goals; tracking of regulatory compliance requirements and goals; and various other projects as determined by the Executive Director. Must have desire to work in innovative and team oriented environment. Position requires strong computer skills with proficiency in Microsoft Excel and Word. Successful candidate must possess strong understanding of water and wastewater operations and ability to understand engineering design and construction documents. HMUA is an equal opportunity employer. We offer a strong benefits package, including NJ State health benefits, pension (PERS), and generous paid time off and holidays. Qualified candidate must possess valid driver’s license, successfully pass a background check, and meet New Jersey residency requirements. If interested, please email cover letter, resume and salary requirements to dpalma@hmua.com or mail to HMUA, P.O. Box 450, Hackettstown, NJ 07840.